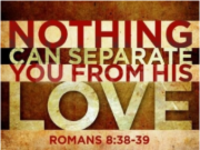 "Paul is convinced that there is nothing that can separate him from the love of God. Where is this strong conviction comes from? Does Paul have a different faith than ours? How come his faith is so powerful and ours is so easily defeated? What’s happening? I believe the key is “convinced”. Convincing ourselves is not something difficult for us to do. We encounter it all the time. However, most of the time, we are in the mode of convincing ourselves into something we “think” is the best (and it may turn out not as expected or even bad) or something we “think” is the worst. We have to learn to convince ourselves not based on our subjective thinking / feeling, but on the promise of God. As God says so, we believe it. No question asked. This is the kind of conviction we need in trusting our Lord and walking with Him in our life journey. Who will separate us from the love of Christ? Will tribulation, or distress, or persecution, or famine, or nakedness, or peril, or sword? For I am convinced that neither death, nor life, nor angels, nor principalities, nor things present, nor things to come, nor powers, nor height, nor depth, nor any other created thing, will be able to separate us from the love of God, which is in Christ Jesus our Lord. (Romans 8:35, 38, 39)"